I so wanted to try Eshana’s creamy curry chicken but was told in no uncertain terms that I must ‘try’ out new things during the week when I’m bored because they’re used to coming home from work not knowing what to expect but Sunday’s they’ve come to expect Chicken Curry with Peas which I’ve long stopped posting, but I came across the most softest roti recipe and well me and roti is just another story – so I’m sharing both. 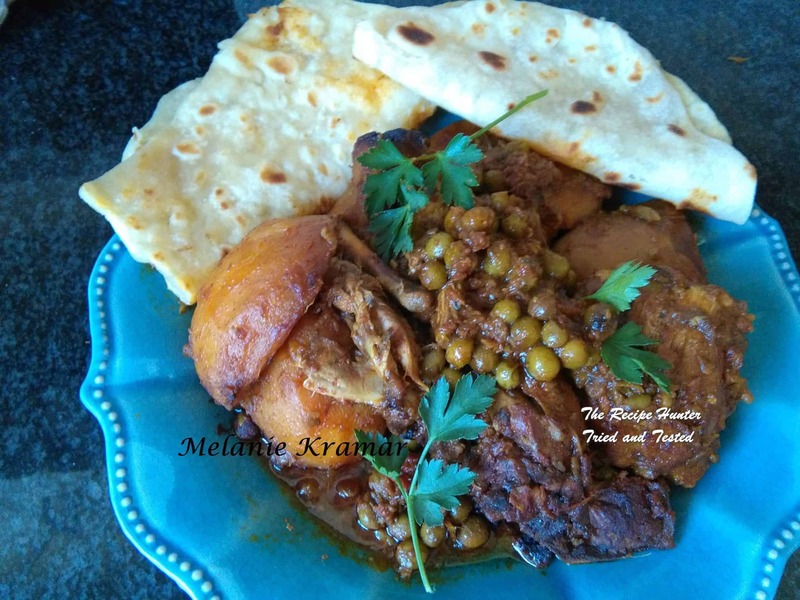 This roti recipe is totally different to the 100’s of recipes I’ve copied and saved. This recipe includes hot milk. Well I don’t care what shape they came out in but they were so so soft. I left them out overnight (by mistake) and the next day they were still soft and pliable. My new go to recipe. Now to just get them round without using a side plate! There are 2 methods. I’m going to state the method I used. I boiled the milk in the microwave and the water in the kettle. Mixed flour and salt. Rubbed in ghee. Then added the oil and rubbed that in. Then I added in all the milk. Mixed with a spoon and gradually added the boiling water still mixing with a spoon then with gloved hands till I could knead properly with just my hands. I had no intention of leaving it for 30 minutes because it didn’t say so in Shenaz Suleman’s recipe, but I got caught up watching TV (with floured hands) and forgot it for about ½ an hour. Then break off balls, then you flatten with your hand first and flour. Then you break into a sweat, then you have a panic attack and try as you might, roll with a rolling-pin and get them as round as you possibly can, then fry as you normally would. I rubbed melted ghee on each finished roti and kept it under a damp tea towel while doing the rest. The Softest rotis. The other method is simply mix salt and flour and rub in ghee. Boil milk, water and oil in a pot and when boiling add to flour and proceed as usual. Dry roast all seeds and grind in coffee grinder till course but not a fine powder. Heat oil and add onion and chilies and fry till onion tender. Add chicken and fry till chicken changes colour and no longer pink. Add salt and curry leaves and allow masalas to fry on a low heat uncovered until it starts catching. Add a splash of hot water from the kettle. Process tomatoes in food Processor with half the dhania including stems. Add tomato/dhania and tomato paste and simmer for at least 10-15 minutes. Cook until chicken is just tender and gravy thickened. Then add potatoes and about ½ cup of hot water or more and allow to cook on medium to low heat until potatoes soft. Add the frozen peas and garam masala and simmer another 10-15 minutes. Thank you so much, I will pass your note to Melanie, she will love to hear this.